Yesterday I noticed a commercial on TV for a new movie. My breath caught when I heard the title, This Is Where I Leave You. How often over the past few weeks have I thought about the void of an empty room, the hollow feeling a trailing wave, the finality of a closed door. 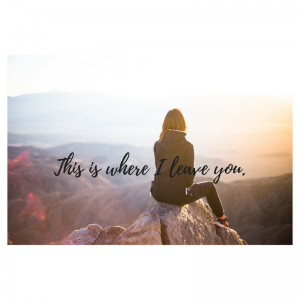 Have you ever spent time with someone you love, seizing every moment before their journey takes them one direction while yours takes you another? Have you known the words were coming but didn’t want to hear them, “This is where I leave you”? If you’re breathing, you know the empty feeling of saying good bye, or avoiding the good bye altogether and using the softer, see ya later. I recently talked to a friend whose youngest child went off to college leaving her with nobody to drop off or pick up at school, no sporting events claiming every weekday evening, and a pretty lonely dinner table. There will be holidays and long weekends, but this season has brought new colors to the landscape – not the colors she is ready for. When my grandson joined the Marines we said good bye to him as he left for 13 weeks of Basic Training. He insisted on no tears and we all bravely complied … up until he said, “This is where I leave you.” There are too many events in our life where the only option demands we take a deep breath and say good bye. Our whirlwind lives occur in such a blur that looking back we see a variation of what was. We take snatches of remembrances drawn from experiences as a way to soothe our aching hearts in moments when we feel loss. Life happens when we aren’t looking and we call it memory. Someone who had been through many distressing circumstances helped me learn to accept change. She taught me to recognize that change is neither good nor bad, it’s only different. I’m a little slow on the uptake and I didn’t embrace her wisdom right away, but gradually I learned that change didn’t mean loss, change didn’t always mean saying good-by. New perspectives don’t magically materialize, nor do problems evaporate. There will always be changes we disagree with, our tender hearts will be broken by the dreaded good-by, we will lose parts of us we know we can’t live without, but in these times we must trust in the God that is bigger than all our terrifying problems and wider than the hollow left vacant by loss. In Romans 1:11 Paul explains a remedy for fear. “I want to see you and share with you the same blessings that God’s Spirit has given me. Then you will grow stronger in your faith.” Recently I heard that in the Bible, we are commanded 365 times to “Fear not”. That’s a command, not a suggestion. Be courageous. Focus on what you have, not on what you’ve lost. Capitalize on what you can do, not on what you cannot. So this is where I leave you. 2 Corinthians 13:11 Good-by, my friends. Do better and pay attention to what I have said. Try to get along and live peacefully with each other. Now I pray that God, who gives love and peace, will be with you. Mind your moments because they become your memories.